Read the article with pictures HERE. Geneva Classical Academy, a school that teaches students Latin by third grade, started extremely small in 1996, with a single room, one teacher and five kindergarten students. Since then, the Lakeland private school has expanded to the point it no longer comfortably fits in its current location sharing space with Parkway Baptist Church on Lakeland Highlands Road. That felicitous problem prompted Geneva’s leaders to buy a former church property about two miles away that provides ample space for further growth. The school paid $1.9 million in June for the former Lakeside Baptist Church at 1736 New Jersey Road. School employees are at work renovating the 72,000-square-foot collection of buildings in preparation for an opening at the new site next August. The new property occupies 11.9 acres. Cali said Geneva currently has access to about a third of Parkway Baptist’s 70,000 square feet on a tract that covers 7 acres. The oldest portion of the former Lakeside Baptist property was built in 1965, according to Polk County Property Appraiser records. Cali said the church’s congregation had declined to the point it no longer needed the entire space. The congregation, renamed Journey Church, now meets at The Club at Eaglebrooke, Cali said. Cali said Geneva’s board of directors started looking for other potential locations even before he was hired, and the search became more urgent in the past two years. Cali said Geneva had 116 students when he became headmaster in 2011. The school now has more than 160 students, he said, including his son, Eric, a ninth-grader. The school draws students from Plant City, Lake Wales and Bartow, while at least half live in Lakeland, said Talitha Bean, Geneva’s community development director. Geneva welcomes students from 4 years old through high school, and most of the students are in the lower grades, Cali said. Geneva has graduated about 30 students so far, he said, and all have been accepted to colleges, though a few have chosen not to attend. The school has five seniors enrolled this fall. Geneva also has a partnership program with home-schooled students, who graduate from the school. Sabrena Smothers started the school in 1996 after learning about a classical school in Orlando. Smothers continued teaching at the school until several years ago, Bean said. The school now has 20 teachers and five other staff members, Cali said. It is overseen by a volunteer board of directors. Geneva is accredited by the Association of Classical Christian Schools, based in Moscow, Idaho. The school follows the classical Christian education model, a movement that sprang up about 40 years ago. The word “classical” refers to both the content and the methods of study at Geneva. The curriculum incorporates Biblical scripture, Latin, logic, literature and rhetoric, along with math, history, science and physical education. Instruction follows the “Trivium” concept developed in Roman antiquity, a three-step process emphasizing grammar, logic and rhetoric. Students absorb information in the lowest grades before being taught critical thinking in the logic (or dialectic) stage in the middle-school grades. The final stage, taught in high school, is rhetoric, in which students are challenged to express themselves. Graduating seniors are required to write a 20-page thesis paper, which they must defend before a faculty, just as a student would while seeking a master’s degree in college. Cali said some former students have told him that college course work seemed easy after having completed their senior thesis at Geneva. The school emphasizes Christian orthodoxy, and families must sign a “statement of faith” acknowledging that religious instruction is part of the curriculum. But Cali said not all Geneva students are necessarily Christians. Geneva’s curriculum also draws heavily on the works of Greek and Roman philosophers. 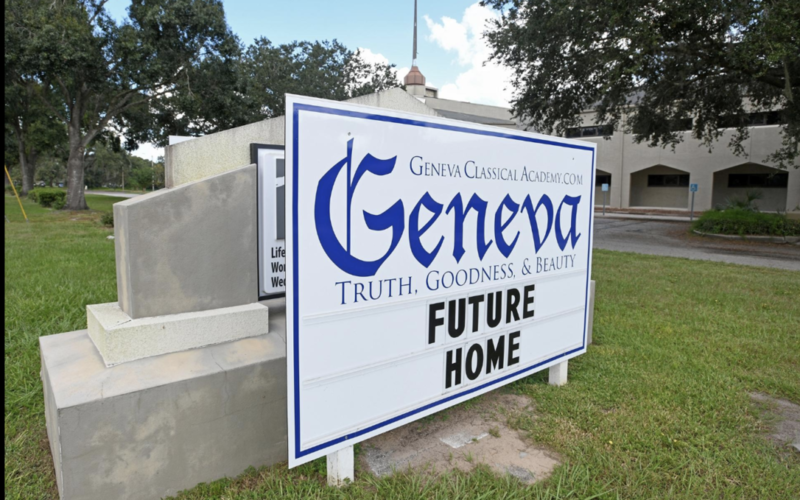 With the closure this year of Heritage Christian Academy in Winter Haven, Bean said Geneva is now the only school in Polk County that adheres to the classical Christian education model. Bean, who has three children at Geneva, said the curriculum reminds her of the instruction she received at a boarding school as a child in South Africa. Annual tuition ranges from $4,200 for half-day kindergartners to $8,900 for high school students. The rate drops to $4,450 for seniors who were enrolled in ninth through 11th grades. Geneva participates in the state’s Step Up for Students program, which provides scholarships for children to attend private schools. That money comes partly from tax-exempt donations by corporations. The school is also supported by a private fund overseen by the George Jenkins Foundation, Cali said. Cali and Bean paid a visit Tuesday afternoon to the new campus, where facilities manager Matt Hingle worked to remove interior walls in a classroom. Walls had been torn out and carpet pulled up in some rooms. Cali said school leaders are concentrating first on roof repairs and will later do major renovations to the interior of the buildings, which are connected by covered walkways. The property has about 30 rooms. The site contains an auditorium previously used as a basketball court, judging from the carpet design and a scoreboard affixed on a wall. A stage occupies the other end of the room. Bean said Geneva will use the auditorium for school assemblies. Two entities, Kindermusik and All Hope Christian Academy, are now using a few rooms at the New Jersey Road property. Cali said Kindermusik might be able to remain, while All Hope will be leaving. The site has plenty of grassy space on its north end, which will be used as fields for Geneva’s sports programs. The school has won a state championship in six-a-side football and also fields teams in volleyball, basketball, soccer, cross country, track and archery. Geneva previously occupied a highly visible spot along Lakeland Highlands Road. The new campus is surrounded by residential development. Bean said some neighbors expressed concerns about the likely increase in traffic on New Jersey Road. She said Lakeland’s transportation department conducted a study of operations at its current site and determined its student pickup procedure is highly efficient. The city also commissioned an engineering firm to conduct a study that found Geneva’s presence will not cause traffic problems on New Jersey Road, Bean said. Geneva plans to lease part of its space, including the sanctuary, to Grace City Church. That congregation, formed in 2015 at the former Westminster Presbyterian Church on South Florida Avenue, has outgrown its space, pastor Andrew Gard said. Grace City holds five services each Sunday. Gard said the church will continue to conduct services there while also holding services at the New Jersey Road site. The original location will be renamed the Chapel Campus, while Grace City will call the New Jersey Road site its Lakeside Campus.